Parking Deck and use the bridge to get to Nordstrom level two. 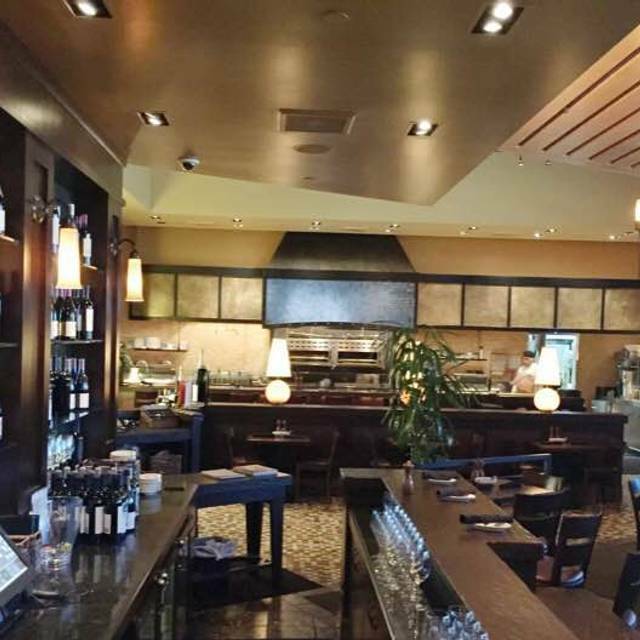 Bazille is located on the second floor of Nordstrom at the Oaks Mall in Thousand Oaks featuring our interpretation of contemporary flavors focusing on bold tastes and textures. Our menu is complimented by a well chosen selection of interesting wines, many available by the glass. We enjoyed our meal and the service was very good. I don't remember the waiter's name - a man, perhaps in his early 50s - with a slight accent maybe? Very good waiter. Quiet - which I liked. Food was delicious, service was good. Super nice staff and ambience. Definitely recommend the maple bacon eggs and the salted caramel cheesecake! Bazille always gets top marks for food but for the first time the service was wonderful. Unfortunately I can’t recall the young ladies name but she was efficient, friendly and very knowledgeable about wine and cocktails. Top class! I still much prefer the Blue Stove...their menu selections, bread and olives, window treatments, etc. much better value for lunch. The food was nice and the drinks were great but it is a type of coffee shop. Always a nice evening out. Cozy eatery. Highly recommend for drinks, small bites, dinner, etc. Trying their wine dinner next. Waiter was not very attentive even though there was plenty of other help (well staffed). Usually I get better service here. Perhaps he was new? Pleasant atmosphere and good service, but overpriced with a scant selection of vegetarian dishes. Been back several times for dinner, lunch and wine dinners. Our server Anica is awesome!! Dined at this restaurant for the second time. It has decent food, great service and nice ambiance. Menu is limited, however, adequate. I remember the lighting to be dimmer the last time I dined there. This time is was a little too bright, which takes away from the ambiance a little. Overall, I recommend this restaurant. Not the same anymore . As Blue Stove it was far superior. The tapas concept was brilliant. As Bazille it is pricier and less choices. Blue Stove was always an exciting experience to order 4 to 6 dishes for 2 people to share. Now as Bazile you have to commit like in any other restaurant. Nordstrom took the "food experience " away. Been going for years... Not sure what has happened to the service. Hopefully it was a one off. Lobster Mac n cheese was amazing and guilt free when shared! Food is delicious, service is helpful, ambience is quiet enough to have a conversation. It is great for people with a refined sense about having a meal with friends. Perfect spot to stop in mid-shopping. I prefer the tapas style of the two previous restaurants, but they did have a “small plates” section on the menu. Decent wine list and cocktail menu. Good and friendly service. I dine here often, and this was the first time that was completely satisfied with everything. 1. The waitress: Jennifer was one the best waitresses I've ever had! Very attentive, courteous, knowledgeable, and friendly. 2. I am in love with the butter that this place serves with the bread!!! Hands down, the best ever. And, after complaining a few times about the cold bread, finally this time they warmed up the bread before serving it! I guess they ARE reading these reviews! 3. Thank you for adding items to your menu...The expansion gives us more choices and the specials menu makes us want to come again to try new things. 4. The avocado toast was very good. The goat cheese and pomegranate jam was excellent. The mango and crab salad was very fresh and tasty. I would've liked to see a little riper mangoes in it, though! Still very good. The special wine was just enough and very good. The pumpkin chocolate cake was wonderful! I was surprised how much the portion size of the crab mango salad had shrunk. I've ordered that salad many times and it was much larger in the past. A sweet find inside Nordstom and great for pre-movie night dinner. Our food was very good and service excellent. I highly recommend it. Can't believe we'd never been to this restaurant! My husband and I try to get together for lunch about once a week (don't have to pay a sitter!) and had been getting bored with the same half dozen restaurants. The service was Nordstrom quality. The food excellent. We'll be back. Quality has decreased somewhat and prices have increased. Not a good combination... I still recommend it for convenient dining while at mall. Had a wonderful get-together lunch with many different tapas plates paired perfectly with wines from their extensive wine menu. Service was terrific. Great job Bazille! We've eaten at a couple of Bazile locations, and always find the service and the food exceptional. That's why we'll actually go to a department store like Nordstrom to have lunch. We have some tried and true favorites, and this time we ordered two of those that are always exceptional, and an appetizer that we hadn't tried before...Kung Pao brussel sprouts. All three dishes were off the mark, and we ate less than half of each. Now to be fair, perhaps we were spoiled by previous experience, but that's why we come back, because we love the food. And the service has always been great, and was on this visit as well. So we hope that whatever is wrong here gets fixed, 'cause we really love this place, but won't be coming back if it doesn't improve. If you want to go somewhere to eat where you can hear your conversation, this is great. Food was all very nice. By now, I have tried everything on the menu and there are only 2 things that I really like here. Everything else is just average or below average. The chicken tacos (appetizer) are excellent and they have the best tasting butter I've ever tasted! They normally serve olive oil with the bread, but you ask for butter, you won't regret it!!! Food was really yummy. Portion sizes great. Service excellent. Business and retirement celebration. Not a huge menu but the share plates and the entrees were all excellent. Great ambience. Friendly and laid back staff and good service. To be honest, I was quite disappointed with Bazille. I had been coming to Blue Stove for years (Bazille’s predecessor), and was excited to try it out. Sadly our food was bland (and way over prized for what we ordered), the server forgot about our appetizer, and we waited with the dessert menus for so long that we had to just get the check by the time she remembered to come to our table (the restaurant wasn’t even that busy even though it was mother’s day). Sadly I don’t think I’ll be back. Always interesting and tasty small/medium portions- just what we look for. Very enjoyable. Thank you. Braised brisket was a bit tough and chewy on the outside. Lime crab salad had very little crab, more of an avocado salad. Tacos to share were delicious. Service very good. Brussel sprouts were delicious. My friend like her scallops. I ordered the Korean beef which in no way simulated the cooking or flavors of this dish. All it was was a piece of oversweetened beef accompanied by boy choy which was gritty because it had not been properly washed. Disappointing.